Thank you so much for following me! I appreciate you as a customer, but more so as a friend. Thank you! 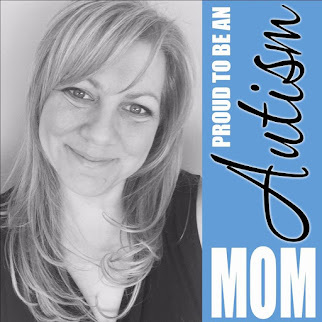 Thank you for sharing my Stampin' Up! business with me, for coming to my classes or just enjoying the samples posted here to my blog. I hope you have a blessed day, today and always! 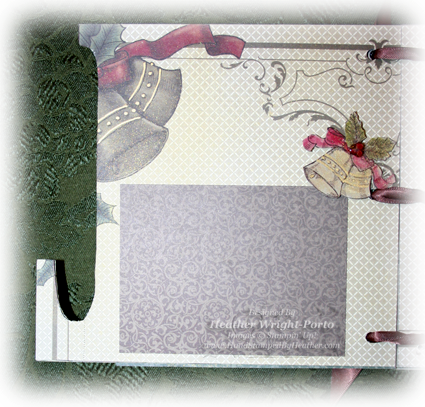 Here is the next set of pages in the B-E-L-I-E-V-E Chipboard album, covered with DECK THE HALLS designer series paper and featuring the BELLS AND BOUGHS stamp set. 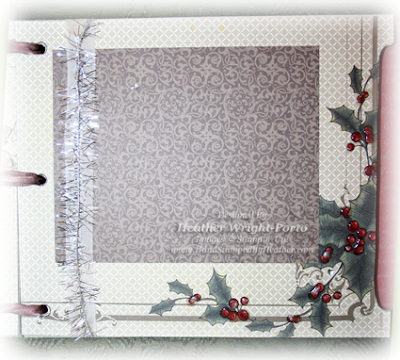 It is also accented with other items from the Holiday Mini catalog, such as the Tinsel Ribbon and the Seam Binding Ribbon. Here is the back of the "L" covered with a piece of DSP with Bells on it. I stamped additional bells in Early Espresso and the colored with a Blender Pen and Gold, Cherry Cobbler and Old Olive (Classic Ink Pads). I also used the Always Artichoke Stampin' Write Marker on the lines of the leaves. Lastly I covered the berries with Crystal Effects. Then, simply added a small picture pat (4 x 2.75) using more of the DSP, but with a brown pattern. In this page, the front of the "I", again another piece of DSP covers the chipboard with holly accents. All berries were covered with Crystal Effects. I really like the look of it and the dimension it adds to this project. Additionally, a 5 x 4 picture mat is laid where Very Vanilla Seam Binding Ribbon and Tinsel Ribbon were added to the left side to add a little sparkle! I hope you are enjoying this album. I really did have a lot of fun creating this and I love all Chipboard projects. I normally cover Chipboard with Designer Series Paper but you can also use a Dauber to cover chipboard with ink or you can actually paint it with paint you may have from a craft store.